It has been a writing-heavy month over at the Worfolk household. On Saturday, I am going to be announcing my new restaurant book. But, between finalising that and sending it to the printers for proofing, I have finished another, and I am announcing that one today. 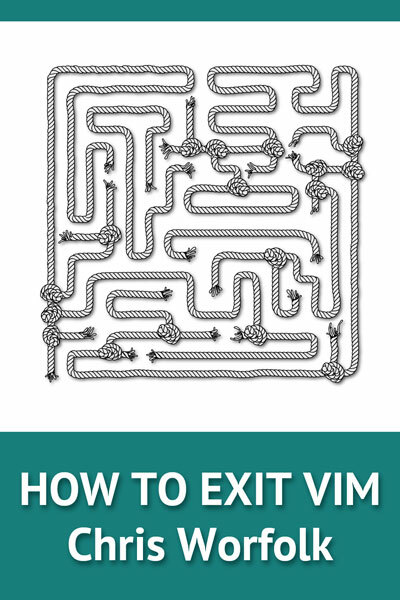 The title is How to Exit Vim. For months I have been joking that what would be really useful is a book on all the different ways there are to exit Vim. For those not in-the-know, Vim is a command-line text editor for Linux. It is notoriously difficult to exit once you enter the program. The truth is, though, that book would be genuinely useful. So I have written it. It comes out on 15 January. You can pre-order it now from Amazon and iBooks. This entry was posted on Thursday, January 5th, 2017 at 2:48 pm and is filed under Books, News, Tech. You can follow any responses to this entry through the RSS 2.0 feed. Both comments and pings are currently closed.